"I was walking up the Miami Beach boardwalk to the Fontainebleau Hotel where Sinatra was staying...I just reached out with the letter in my hand and he took it. He opened it, read it...turned to his security men and said, "this kid's with me." I never found out what Ava said to him in that letter. From that moment on, I was part of his inner circle." - Terry O'Neill. From The Beatles to the Rolling Stones, Terry O'Neill fast became the photographer of the 1960s. Having an eye - and ear - for music and musicians, he instinctively knew what bands to focus on. And they in turn trusted him. "I remember sitting in a pub with the Beatles and the Stones. We were just hanging-out and talking about what we'd do next, after all of this was over. By this, we meant the fame, being the 'new kids of the moment'. Usually, this sort of celebrity doesn't last. Little did we know that 60 years later, we'd still be at it." Music lead O'Neill to Hollywood and working with stars resulted not only in to memorable moments but long-lasting friendships. He travelled with Frank Sinatra. Took Raquel Welch to the beach. Went in the ring with Ali. Put The Who in a cage. O'Neill captured many of the most unforgettable faces from the frontline of fame, and his photographs exude his own brand of serene simplicity, intimate behind-the-scene moments and the rare quality of trust between photographer and subject. 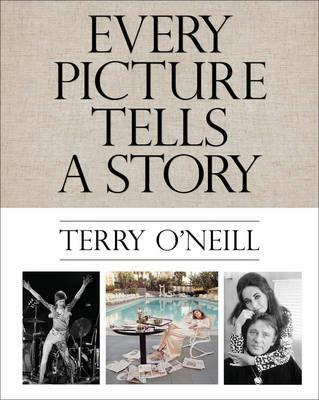 The list of people Terry O'Neill has worked with over the past 60 years is a Who's Who in celebrity; from film to music, sports to politics. Terry O'Neill: Every Picture Tells a Story is like going through a walking tour of memory by a man who has seen, met and photographed them all.